Shea Reliford has overseen the Indiana Clearinghouse for Missing Children & Missing Endangered Adults since September 2016. He is also a First Sergeant with the Office of Intelligence and Investigative Technologies and serves as the Administrative Officer for the Indiana Intelligence Fusion Center. 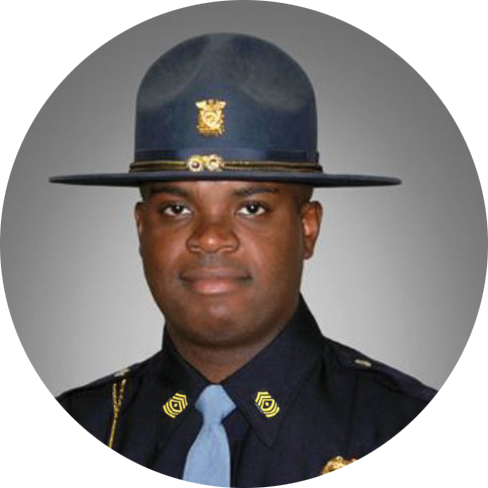 He began his career with the Indiana State Police in 2006. Previous duties include serving as a state trooper, police academy counselor and instructor, human resources sergeant, field training officer, recruiter, emergency vehicle operations instructor and background investigator. What is unique to your AMBER Alert and Clearinghouse program, and what do you think helps make your program(s) successful? The Indiana Clearinghouse is a section of our Fusion Center. When an AMBER Alert is requested, all resources necessary are deployed whether or not an AMBER Alert is actually activated. This includes analytical support from the Indiana Intelligence Fusion Center, Public Information Office, Cybercrime & Investigative Technologies Section, Indiana Crimes against Children, K-9 and additional investigators and officers. Our success is due to close relationships between the personnel involved with the decision making around an AMBER Alert. Our procedures and request forms are on our website for quick access. We educate law enforcement to call the clearinghouse as soon as possible and we can assist them with an AMBER Alert or any missing person situation. What challenges do you face in maintaining the effectiveness and strength of your Clearinghouse program? Our number one issue is missing persons not being entered into NCIC immediately. Because AMBER Alerts do not occur frequently, agencies, officers and dispatchers are likely finding themselves involved with an alert for the first time; this inexperience with AMBER Alerts can sometimes cause a delay. We prefer agencies call us as soon as possible so we can assist them from the start to speed up the process. What would you like to see happen with your AMBER Alert and Clearinghouse programs in the future? I would like to see a nationwide platform where other states can communicate with each other, and with a push of a few buttons all processes needed for an AMBER Alert to happen can be performed at the same time. Currently we use about five different entities to carry out all of the functions, including emails, phone calls and other software programs. Please share details about your most memorable success story in working a missing child case. How did the AMBER Alert and operations of the Clearinghouse support the outcomes? What were the most important lessons learned? We activated the Wireless Emergency Alert (WEA) for the first time in September 2016, and law enforcement and the public were energized and very supportive in finding missing children. We also learned there would be backlash no matter what you do. We received questions such as whether it is necessary to activate AMBER Alerts statewide or in the middle of the night. However, our goal is to bring missing children home safely and we have better success if we notify the public by all means available. How have your career and life experiences, including your work as a Clearinghouse Manager, strengthened your commitment to helping endangered, missing and abducted children? With the first AMBER Alert in which I was involved, both of the children were killed. I am committed to doing everything within my power to prevent that from happening again.